Previous China trip posts: Shanghai, Hangzhou, Huangshan, Kunshan. From the wedding in Kunshan, we took a domestic flight to Xi’an. Xi’an is further north and west in China, compared to Kunshan and Shanghai. It is a previous capital of China, and served many dynasties as their capital. The most famous things in the Xi’an area are the tomb of Qin Shi Huang, China’s first emperor, and the old city wall. We visited both of these sites on the same day, and both of them were cool. 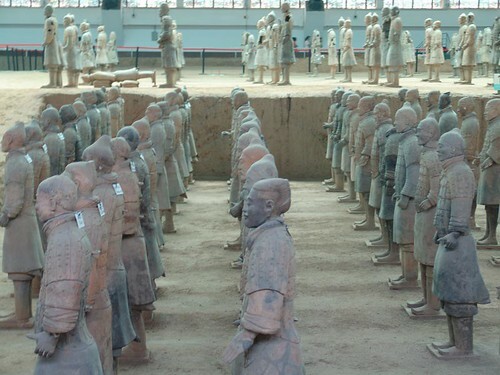 The emperor’s tomb is famous because of the terracotta army that was built and buried around him. Even though most of it is not excavated and is thus just a bunch of huge dirt pits, the visible portions are indeed impressive. There are thousands of figures in real-life size. The city wall is also pretty cool. Unfortunately during our visit it was a bit cloudy / foggy, so visibility was limited. But nonetheless, it was a nice attraction. Overall, Xi’an was pretty nice too. The only exception was an incident as we arrived at the airport. We got there on time, but our bus driver refused to drive us to the city, which is an hour away on the highway. We had the advertised number of people (14 I think), with one suitcase per person (Chinese domestic flight limitation anyways), so it’s unclear why he refused to drive. He never explained it, even after much arguing with our guide. So we grabbed dinner and waited at the airport, while a new driver and bus were dispatched. Strange, annoying, but not a major deal. From Xi’an, we took an early morning flight to the new capital, Beijing.